This week is National Chemistry Week and we are mixing up some crazy, scientific fun! National Chemistry Week is an annual event coordinated by the American Chemical Society to promote the value of chemistry in everyday life. 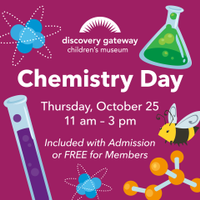 To celebrate Chemistry Week, Discovery Gateway will be having a special Chemistry Day with loads of hands-on science experiments! Join us throughout the week of October 22nd for more awesome chemistry activities.